as effective as conventional anti-inflammatories for treating arthritis, with no unwelcome side-effects. > SAM-e is a highly-reactive and therefore very fragile molecule which degrades rapidly when subjected to heat, humidity or gastric acids. In fact, a poorly packaged SAM-e product will degrade in just a few hours, resulting in a total lack of biological activity. In order to preserve SAM-e from heat and humidity, it is essential that each tablet is double foil blister-packed. To protect it from gastric acids, it must be enteric-coated: pharmacokinetic studies show that this results in maximum serum levels. This type of packaging is more expensive but it is quite simply essential. 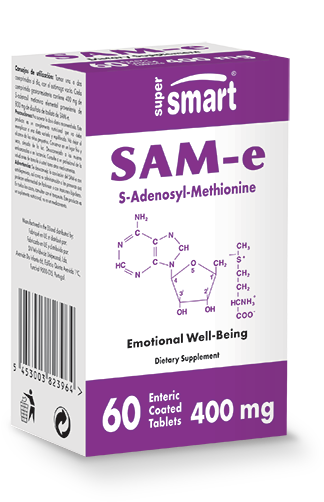 Like SAM-e, other substances with excellent therapeutic potential are also available as nutritional supplements. Super Quercetin, for example, is a quercetin concentrate with antioxidant, anti-inflammatory, anti-carcinogenic and cardio-protective properties. Two natural extracts also recognised for their therapeutic efficacy are French oak, for reducing fatigue and improving mood, and hypericum, for combatting mild to moderate depression. Other ingredients: microcrystalline cellulose, mannitol, starch, sodium carboxymethyl cellulose, colloidal anhydrous silica, glycerol behenate, magnesium stearate, methacrylic acid copolymer, glycerol palmitostearate, medium-chain triglycerides, talc, triethyl citrate, FD&C yellow No. 5. Each gastroresistant tablet provides 400 mg of elemental S-Adenosyl Methionine. Take 400 to 800 mg a day on an empty stomach, as required or as advised by your therapist. For preventative use, take 200 to 400 mg a day. This product is suitable for vegetarians. Taking SAM-e is not advised for those who are on antidepressants, or who have Parkinson's disease or bipolar disorders. In these cases, please consult your therapist.